Use this easy recipe to make Korean steamed tofu with dipping sauce. Known as dubu tchim in the Korean language, this dish can be made on the stovetop, or even in the microwave, if you're truly pressed for time. It goes to show that not all Korean cuisine takes a time commitment to make. This meal is not only quick and convenient to prepare, but it is also healthy, versatile and good with any number of Asian dipping sauces. In a nutshell, it is a classic Korean dish that is good in any season. Can you name any of the health benefits of tofu? While tofu is now a well-known food internationally, in mainstream American culture, it is often still associated with crunchy vegetarian types rather than viewed as a food that even omnivores can enjoy. If you want to cut back on the amount of red meat you're eating or simply want to mix things up a bit in the kitchen, tofu is a good food to try because it not only contains a lot of protein but all of the major amino acids. The food is also a good source of many nutrients and minerals, including iron, calcium, manganese, selenium, phosphorous, magnesium, copper, zinc and vitamin B1. So, if you're lacking in any of these nutrients, give tofu a try. To begin making the dish, cut tofu into cubes or slices, roughly the size of cell phones. You can also steam it whole if you wish, and then cut it up later. If you're going to be using a microwave to prepare the dish, place the tofu on a safe plate and cover it loosely with a damp paper towel. 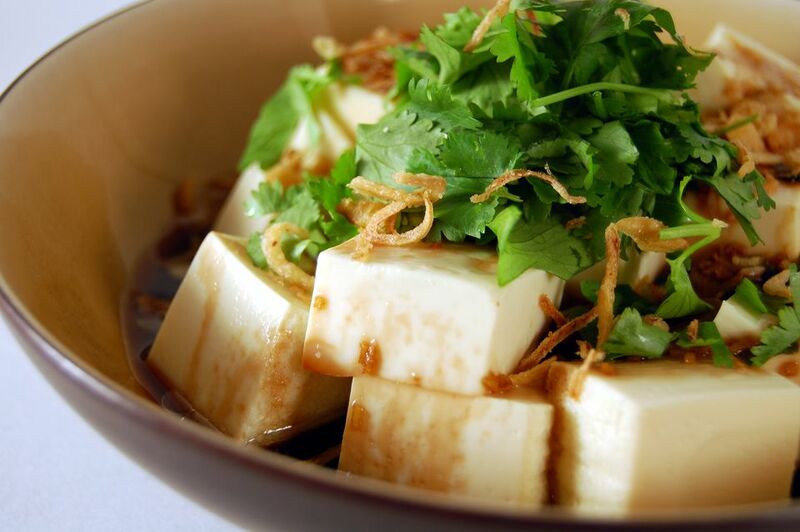 If you will be using a steamer, steam the tofu on the stovetop for about 5 to 7 minutes. Once you've finished steaming, serve the tofu with the dipping sauce of your choice. It could be spicy dipping sauce, vinegar dipping sauce or ginger dipping sauce. You can pour the sauce over the tofu or serve it on the side. if you're serving a few different people and aren't sure what their dipping sauce preferences are, serve the dipping sauce on the side. If you're not familiar with tofu dipping sauce and not sure which dipping sauce you'll prefer, consider serving a plethora of different dipping sauces so that you and your family or friends can sample a variety. Tofu and soy have earned some negative headlines based on their purported link to breast cancer, but scientists now say the link between soy products and breast cancer is unclear and that women in Asian countries, where these food items are extremely popular, develop breast cancer at lower rates than Western women do.